Floor scrubbers are automated solutions recently introduced in the market keeping in mind the cleaning requirements in industries. Their benefits lie in making industrial cleaning easier and more convenient. Industrial floor scrubbers are available as walk-behind, ride-on and robotics floor scrubbers, specifically adopted by the end-use industries. As these floor scrubbers offer a high level of cleanliness that helps in keeping the environment dust-free and reduces bacteria build up, experts foretell their demand to surge higher in the future. Additionally, the launch of industrial floor scrubbers with artificial intelligence is slated. This development will help execute tasks requiring human intelligence. Spurred by these factors, the global industrial floor scrubbers market is forecast to exhibit strong growth in the coming years. On the flip side, the high cost of these products are posing threat to the global industrial floor scrubbers market. The factor also inhibits the market’s penetration in emerging nations. Considering the scenario, the global industrial scrubbers market is forecast to exhibit a CAGR of 8.5% between 2017 and 2025. At this pace, the market’s valuation will reach US$6.62 bn by the end of 2025, from US$3.24 bn in 2016. By type, the global industrial floor scrubbers market is categorized into walk-behind scrubbers, ride-on scrubbers, and robotic scrubbers. Among these scrubbers type, robotic scrubbers segment is anticipated to show large-scale adoption due to rapid development in advanced technologies in the industrial floor scrubbers across the world. Of these, the demand for walk-behind scrubbers is forecast to remain the maximum through the course of the forecast period. By the end of 2017, it is expected to hold over 51% of the overall market. However, over the course of the forecast period, the demand for robotic floor scrubbers is expected to rise at a higher pace. The rising demand for automation across industries will aid the segment’s growth in the coming years. Further, the end-use industry segmentation includes transportation, healthcare & pharmaceuticals, government, education, hospitality, manufacturing & warehousing, and retail & food. Of these, the manufacturing and warehouse segment emerged dominant in the market in 2016. On account of stringent regulations impelling industries to focus more on cleanliness, the demand from the manufacturing and warehouse segment is forecast to remain high through the forecast period. Furthermore, healthcare & pharmaceuticals industries are anticipated to witness strong growth in near-term, largely due to growing focus on sustainability. Regionally, North America, Europe, Asia Pacific, South America, and the Middle East and Africa constitute the key market segments. North America’s share in the overall market is expected to reach 33.5% by the end of 2017, thus the region is expected to emerge lead in the future. Europe has emerged as the second-leading market for industrial floor scrubbers. Through the course of the forecast period, these regions are expected to continue leading the market. Owing to rapid industrialization and the rising awareness about the latest technologies, industries in Asia Pacific are also expected to showcase increasing demand for industrial floor scrubbers. The robust growth in healthcare, food, and manufacturing industries will aid the expansion of the industrial floor scrubbers market in Asia Pacific. Alfred Karcher GmbH & Co. KG, Bortek Industries, Inc., iRobot Corporation, Ecovacs Robotics, Factory Cat, Hako Holding GmbH & Co. KG, Nilfisk-Advance, Inc., Tennant Company, Tornado Industries, Inc., and Wiese, Inc. are a few of the leading players operating in the global industrial floor scrubbers market. This report provides an analysis of the global industrial floor scrubbers market for the period from 2015 to 2025, wherein the period from 2017 to 2025 comprises the forecast period and 2016 is the base year. Data for 2015 is provided as historical information. The report covers all the major trends and technologies playing a major role in the growth of the industrial floor scrubbers market over the forecast period. It also highlights various drivers, restraints, and opportunities expected to influence the market’s growth during this period. The study provides a holistic perspective on the market’s growth in terms of revenue (in US$ Mn) and shipment (in units), across different geographical regions namely North America, Europe, Asia Pacific, Middle East & Africa and South America. The market overview section of the report showcases the market dynamics and trends such as the drivers, restraints, and opportunities that influence the current nature and future status of this market. The report also provides the value chain analysis and key market indicators for the industrial floor scrubbers market. The industrial floor scrubbers market data estimates are the result of our in-depth secondary research, primary interviews and in-house expert panel reviews. These market estimates have been analyzed by taking into account the impact of different political, social, economic, technological, and legal factors along with the current market dynamics affecting the market growth. Industrial floor scrubbers helps in reducing labor cost, improving productivity as well as efficiency. Floor scrubbers are available in numerous sizes and configurations depending on the industrial requirements. The large-sized floor scrubbers carry larger batteries and more water as compared to small floor scrubbers. This increases the runtime as well as productivity. Growing adoption of green cleaning technologies especially in mature markets such as Europe and North America to make sustainable environment are expected to boost the demand for industrial floor scrubbers in coming years. In addition, the adoption of industrial floor scrubbers are unceasingly increasing in developing regions such as Asia Pacific and MEA due to growing health and hygiene concern among end-users. Rising demand for sustainable technology and increasing focus on environment sustainability, forcing companies to design innovative floor scrubbers with high efficiency to continue the profitability of the market. The reports includes global industrial floor scrubbers market is bifurcated on the basis of type and end-use industry. By type, the global industrial floor scrubbers market is categorized into walk-behind scrubbers, ride-on scrubbers and robotic scrubbers. Further, the end-use industry segmentation includes transportation, health care & pharmaceuticals, government, education, hospitality, manufacturing & warehousing and retail & food. 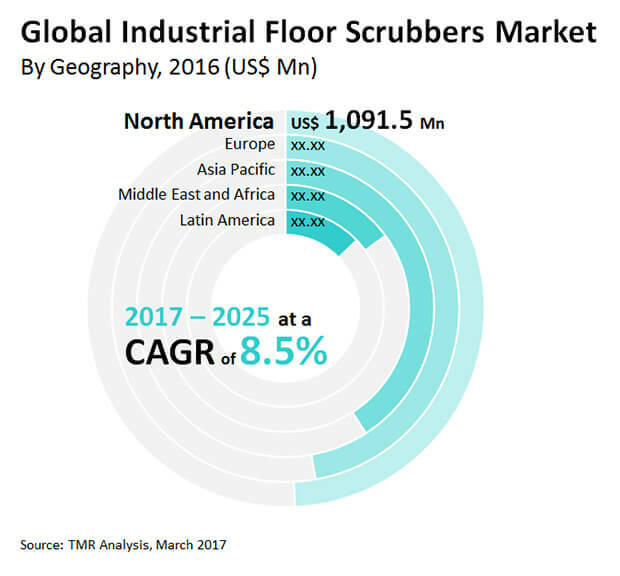 The report covers the analysis of these segments across all geographies, along with qualitative analysis for key market indicators supplementing the growth of industrial floor scrubbers market during the forecast period. The report also includes competitive profiling of the key players associated with the industrial floor scrubbers market around the globe. The important business strategies adopted by them, their market positioning, financials, SWOT analysis, and recent developments have also been identified in the research report. The competitive landscape section of the report also gives an overview about the major contributing regions/countries by these key players in order to strengthen their market position in the future. Alfred Karcher GmbH & Co. KG, Bortek Industries, Inc., iRobot Corporation, Ecovacs Robotics, Factory Cat, Hako Holding GmbH & Co. KG, Nilfisk-Advance, Inc., Tennant Company, Tornado Industries, Inc., Wiese, Inc., , are a few of the key players profiled in this study. Details such as financials, business strategies, SWOT analysis, recent developments, and other such strategic information pertaining to these players has been duly provided as part of company profiling.